The staffing company delivered on its guidance, but declared its customers were being a bit more cautious about hiring. Given the volatility in equity markets and slowing growth in the global economy, investors had a right to be slightly fearful about staffing company Robert Half International's (NYSE:RHI) fourth-quarter results. In the end, the numbers were pretty much in line with guidance, although management declared that customers took a more cautious tone at the end of the year. Let's take a closer look at the earnings and what management had to say about trends in its business. No one wants to be holding a stock when management is expanding headcount in order to capture growth that suddenly dissipates when the economy turns downward. That's the scenario Robert Half investors were faced with in 2015, as it expanded its number of full-time employees by 14% to 12,800. Its selling, general and administrative costs, or SG&A, increased to 32.5% of revenue in the fourth quarter, compared to 32% in the same period last year. However, revenue and gross margin also increased enough to more than make up for the increased SG&A costs. Net service revenue rose 6.8% to $1.305 billion in the fourth quarter, slightly below the midpoint of its $1.285 billion to $1.335 billion guidance range. Meanwhile gross margin increased 7.9%, with SG&A up 7.7%. The second point is important because in typical recoveries, permanent hiring tends to significantly outpace temporary hiring as more permanent jobs are lost in the recession -- so it follows that these jobs should come back during a recovery phase. Well, I would say that our people would observe that in November, December, the clients got a little more cautious. Whether that's due to market uncertainty or other reasons, the headlines about China, oil, etc., we could all debate. But our clients did get a little more cautious, not significantly more cautious. Turning to the second subject, Waddell discussed the sluggishness of the recovery since 2009: "Perm has also outgrown temp every year and this cycle as well. So that's not unusual. The degrees or something, I guess we could have a discussion about"
Putting these two points together, it's clear that some uncertainty on the economy slipped into Robert Half's customers' thinking in the fourth quarter, and a look at ongoing permanent versus temporary revenue growth rates reveals a closing of the gap in growth in the U.S. 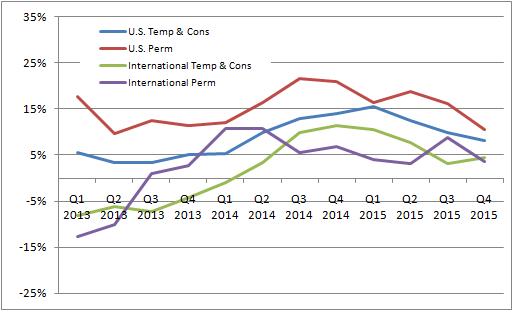 Meanwhile, international's temporary placement growth was actually stronger than permanent growth in the fourth quarter. DATA SOURCE: ROBERT HALF PRESENTATIONS. FIGURES ADJUSTED FOR SAME BILLING DAYS AND CURRENCY. All told, the company basically hit its guidance for Q4, but it's the future that counts. Management's prediction for the first quarter is for revenue of $1.27 billion to $1.33 billion, implying growth of 8% at the midpoint, while adjusted EPS guidance of $0.61 to $0.67 implies an increase of 10% at the midpoint. Clearly, Robert Half needs the economy to improve, and more important, it needs sentiment on the economy to improve. In addition, investors will be looking for a pickup in permanent hiring in the U.S. in future quarters in order to confirm that the economy and Robert Half are firing on all cylinders.